KASHIHARA, Nara Pref. (Kyodo) Researchers have excavated an ancient stone sluiceway among the Sakafuneishi ruins in Asuka, Nara Prefecture, which they believe channeled water from a spring to the turtle-shaped basin found earlier this year, the Asuka Village Board of education announced Wednesday. Various sculpted stone objects believed to be evidence of the existence of a water source near the ruins of the seventh-century Asukakyo palace had already been unearthed at the site. However, the latest finding is the first time archaeologists have apparently succeeded in tracking down a water source and the path that water would have taken. The spring still flows today, education officials said. The results of the ongoing excavation further support the belief that the Sakafuneishi ruins were used by Empress Saimei (594-661) for religious services using water, they said. The sluiceway was found to the south of the oval- and turtle-shaped basins unearthed in February. The opening of a square shaft in the direction of the spring measuring 1.8 meters x 2.4 meters was surrounded by stone blocks. At the center of the shaft was a tower 1.3 meters high. The mouth of the sluiceway is about 2.5 meters away from the oval basin. Earthenware and coins dating back to the Heian period, which began in 794, have been excavated around the ovalshaped basin. Researchers said the turtle-shaped basin might even have been used for several hundreds of years prior to the Heian period. 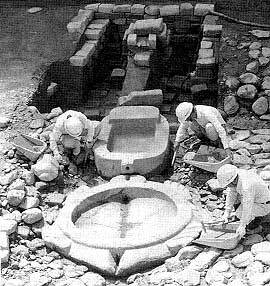 OSAKA - Archaeologists on Wednesday dig around an ancient turtle-shaped stone basin and adjacent enclosure that is believed to have been the source of a spring.